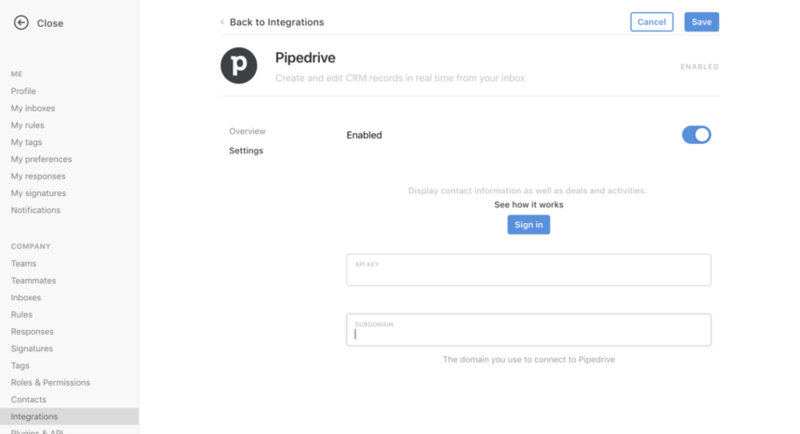 The Pipedrive integration allows you to bring information about your leads and contacts into Front — it's like having your CRM in your inbox. Keep records updated in real time, and get the context you need on every conversation before you reply. 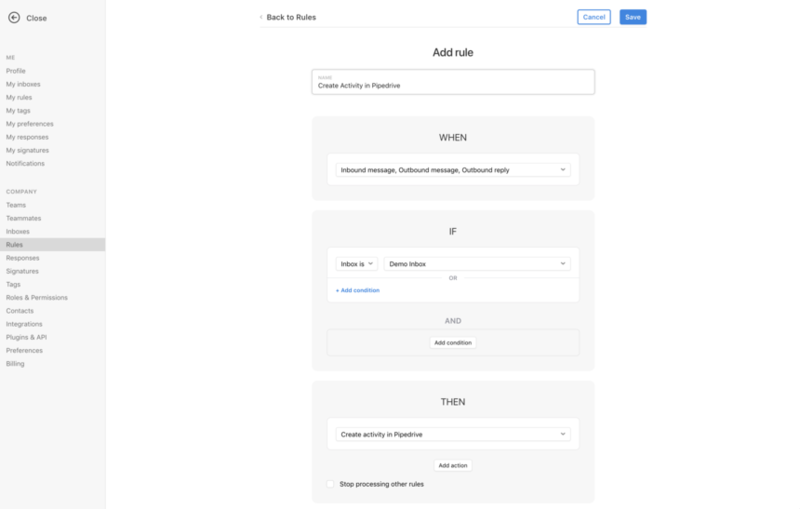 You can also use rules to log Front activities to Pipedrive automatically. 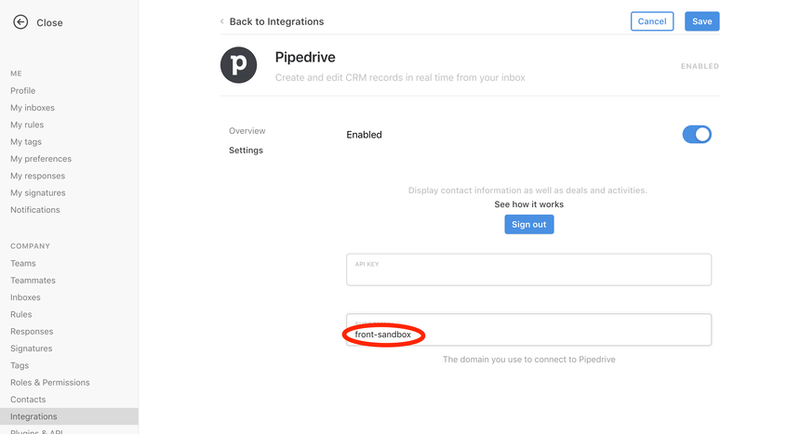 Like other integrations, you need to be an admin in order to enable the Pipedrive integration. Go into your Settings and select Integrations. Click Pipedrive, and Enable integration. Sign into Pipedrive and authorize the app. Retrieve your Pipedrive Subdomain by logging in to the Pipedrive website. 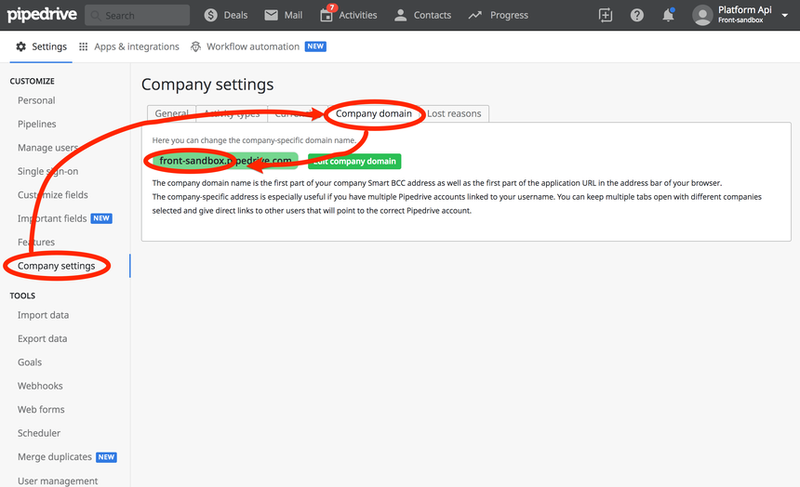 In the settings, select Company settings, and Company domain to find your Subdomain. Copy and paste your subdomain into Front. Click Save to finish enabling the Pipedrive integration. 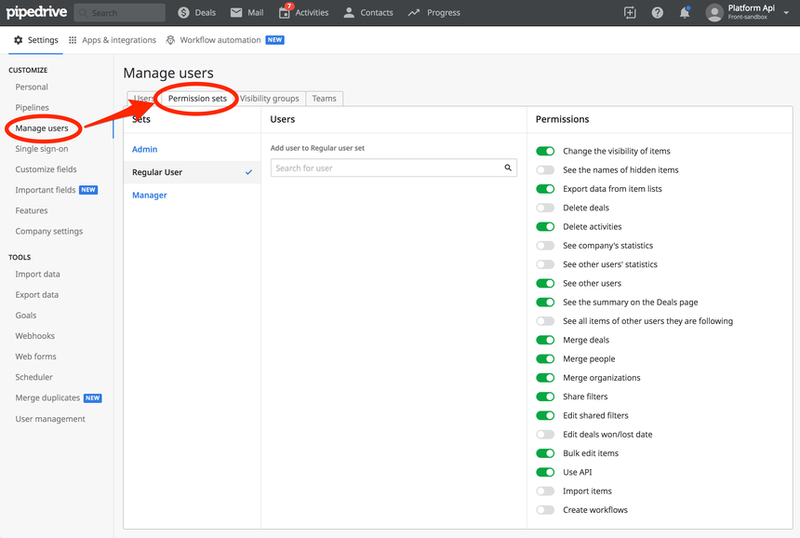 After the integration has been enabled in your integration settings, each user will see Pipedrive as an available integration in the integrations panel. Open the integrations panel by clicking on the arrow located on the top right corner of your Front interface. Each user will need to sign into Pipedrive themselves to begin using the integration. 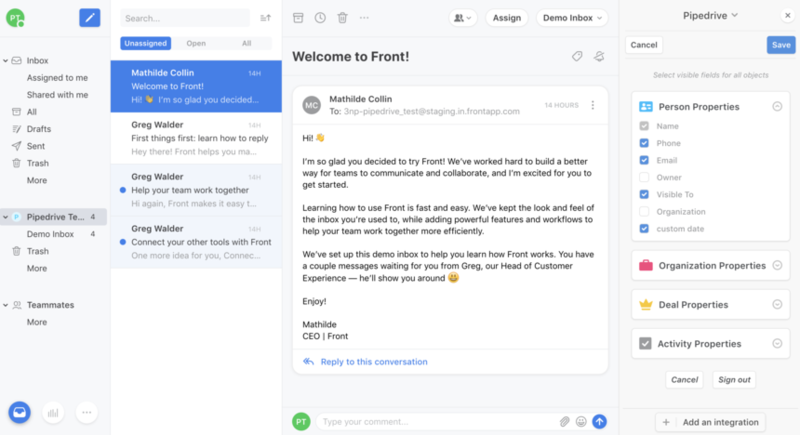 The Front integration respects the permissions you set for the user in Pipedrive. For example, if a user is not permitted to see a company contact record, that record will not be shown to them in Front. Below is a recommended set of permissions to allow users to fully utilize the Pipedrive integration. You can set permissions for users by selecting Manage Users in your Pipedrive settings, then the Permission sets tab. Add permissions as needed for each permission set. With the Pipedrive integration enabled, you can now display and update information about your contacts, deals, and activities directly in Front. You will be able to see the information available about the contact in Pipedrive within Front. The links will take you to the respective pages in the Pipedrive interface. If that contact isn't in Pipedrive yet, you can create the contact. In the case that an object is not visible to you, contact an owner or follower and have them add you as a follower — it will appear when the page reloads. You can manage which fields are shown in the integration by clicking on the gear icon at the top of the integration panel. When you expand each object card, you'll see a list of available fields. Select the fields you want to have displayed before saving. Need to sign out? Click the same gear icon in the top right and click Sign out at the bottom of the panel. If you link your Pipedrive account, a new action will appear in rules. Go to Settings, select Rules, and Add a team rule. Define conditions and select Create activity in Pipedrive as the action. This will add the content of the message as a new activity associated to the contact, assuming this contact exists. Helena Li we have already contact Support numerous times about this. Front's integration with Pipedrive is not 2-way. All I've gotten from Support is apologies and shrugs. It doesn't appear Front is willing or able to make this integration real. When people text in via Twilio, Front automatically creates a new contact in Pipedrive with a phone number for a name, regardless of whether or not a contact with that phone number and a real name exists in Front or Pipedrive. This is how duplicates are created. If we have open conversations in Front, and a new Deal is opened in Pipedrive from a web lead, it is not visible in Front. Only Deals opened through Front are visible in Front. If a contact has multiple open Deals, they are not all visible in Front. Duplicate Deals are created this way. 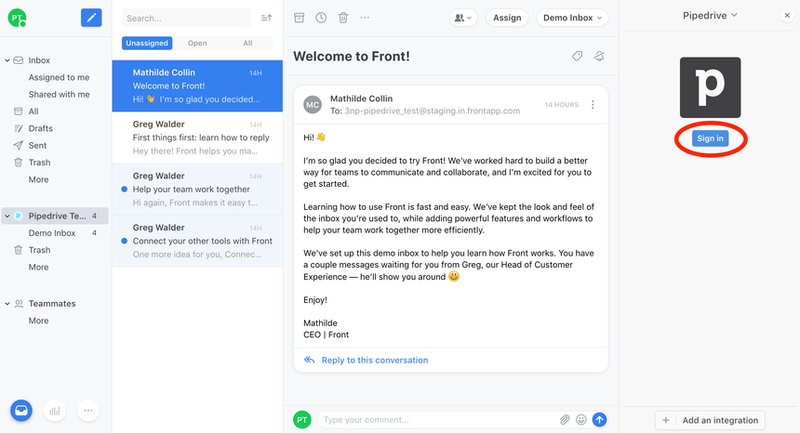 Front has landed a ton of funding. They're shipping out new features and integrations all the time. 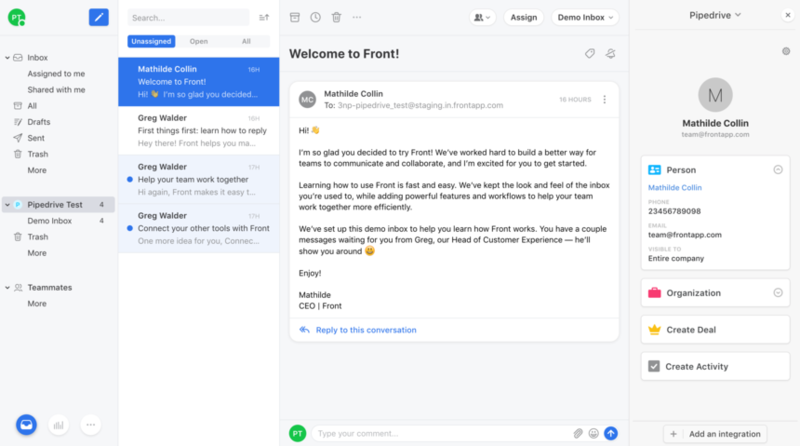 I wish they would use these resources to focus on making existing integrations and features work better, and I sure wish they would have beta tested the Pipedrive integration as these very basic issues would have surfaced immediately. We've created a feature request in our backlog for the first issue regarding searching for contacts by phone number. We will let you know as soon as we build this improvement. For the second point, we're not able to recreate this. Would you please email us so we can further investigate this issue? Cori Morris I reconnected Pipedrive to Front and am actually seeing conversations synced to open Deals (at long last!). However, if there is a conversation going and a deal is opened up, prior conversations (even within minutes) are not synced to it. I can understand that, though it would be nice if recent conversations (at least within 24 hours) were synced to Open Deals.